The Rapid Action Battalion has enjoyed strong public support for routinely killing alleged criminals. But is it always acting within the law? Limon Hossein had just been accepted into college when he was shot by black-clad police from Bangladesh’s elite Rapid Action Battalion. The 16-year-old was tending to his cows near his village of Jhalakati in southern Bangladesh when several members of the feared ‘RAB’ arrived on motorbikes and zeroed in on him. The teenager’s case has triggered an outpouring of criticism of the RAB, which generally enjoys strong support in Bangladesh for its routine killing of those it accuses of being ‘criminals’ and ‘terrorists.’ The force claims Limon was part of a local gang injured in a shoot-out with RAB commandos, but local journalists and rights activists have questioned the account, calling attention to the battalion’s brutal tactics. 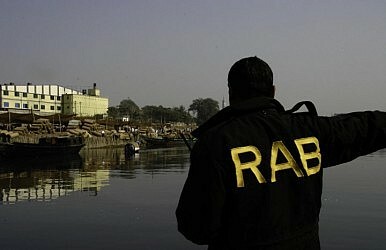 The RAB, composed of elite members of the army and navy, was formed in March 2004 to target the armed criminal gangs and extortion rackets operating in many parts of Bangladesh. Its officers, clad in pitch-black uniforms with bandannas and mirror shades, soon became a common—and imposing—fixture on the streets of Dhaka, earning a reputation for ruthless efficiency. Adilur Rahman Khan, secretary of the local human rights group Odhikar, says RAB committed its first extrajudicial killing on the fifth day of its operations in 2004. ‘Since then they are operating with impunity,’ he says. According to a recent report by Amnesty International, the force has been responsible for the unlawful killing of ‘at least’ 700 people since its inception. Despite promises by Prime Minister Sheikh Hasina to halt extrajudicial killings when she came to power in early 2009, Amnesty claims at least 200 deaths have occurred on her watch. Earlier this month, five alleged muggers were shot dead in Dhaka’s Uttara district, but questions remain over the officers’ use of deadly force. The RAB routinely claims its victims were involved in criminal activity and were killed by crossfire or in ‘shoot-outs’ with the authorities, and rights activists say no RAB officer has ever been prosecuted or held to account for any killing. China, Japan, and India are all competing to build Dhaka's first deep sea port.